Interior design is so much more than just curtains and cushions. In the past the industry made a clear distinction between interior design and interior decoration, something that more recently has become confused. Whilst interior decoration (curtains, blinds, cushions, wallcoverings, carpets etc.) remains a key element of a completed project, this is the fun dressing stage. The work of the interior designer begins way before that, at the building design stage. As interior designers we must have a core understanding of the building design and process. From the outset we need to have a clear vision of the finished product. Whilst the architect and contractor are focused on delivering the structure of the building it is the role of the interior designer to work alongside the client to select all the finishing elements. This means that all the trades on a project will be reliant on the designer to provide the technical information required at each stage of the build. Our responsibility is to provide a co-ordinated look and feel for the property that is sympathetic to the architect’s vision but that also works for the client on every practical level. An interior design company also brings thousands of hours of combined practices across multiple projects as well as a well-thumbed “black book” of suppliers. By acting as a bridge between client, architect and contractor we can increase the speed of decision making and ensure that the right information is available at the right time to avoid costly mistakes and delays. Often decisions that seem far down the line can have an impact very early on in the build. Take flooring for example; whilst the final product and colour can wait, the decision on the actual material to use is critical very early on. Whether wood, carpet, ceramic or stone, the main contractor will need to know the thickness and build up for each surface to be able to ensure screed levels allow for finished floors to transition perfectly without unsightly steps and lips. Lighting is one of the most important elements of good design. Not only must we consider light levels and aesthetics but also the flexibility and control required. The location of wall lights needs to be considered in conjunction with where art will hang. Bedroom reading lights cannot be positioned for the electrician without knowing the size of the bed and the headboard. In fact it is impossible to get the lighting and socket positions right without first having a clear concept of how the space will be arranged and the basic furniture layout. This is particularly relevant for the positioning of floor sockets, for example. In many new builds we are often dealing with vast amounts of glazing, and unusual window shapes. It is key upfront to understand the issues this will bring – glare, heat, privacy, blackout for bedrooms etc. This means that we can allow early on for any wiring requirements but even more crucially to instruct the creation of recesses to hide blinds or rebated ceiling tracks. These are just some of the examples of the elements that an interior designer must consider. Things can be tweaked along the way and over a long build period there will obviously be some changes, but it is one thing to instruct a change in colour for a certain wall, quite another thing to make sure that the wall was built in the right place from the outset! 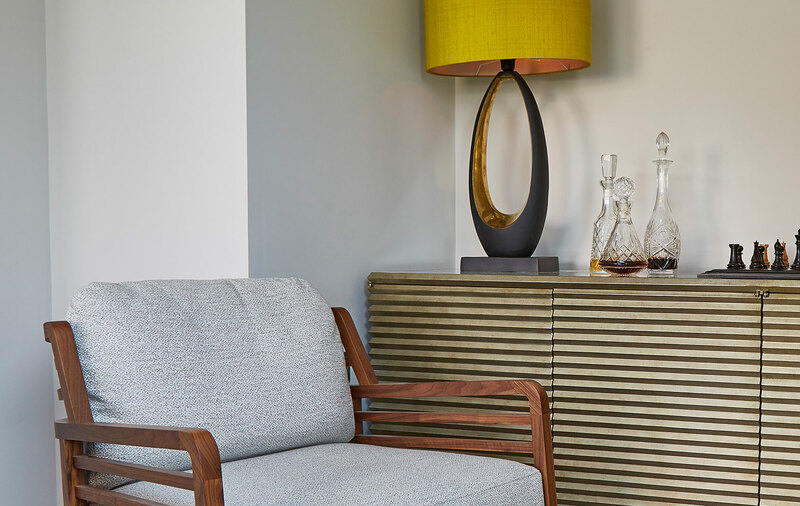 From new builds and large-scale renovations to single room refurbishments we deliver a personal and comprehensive interior design service from the southwest of England and beyond. We guide your project to completion making sure nothing is left to chance; acting as a bridge between architects and contractors to ensure all details of the interior space are fully considered during the design and build process.